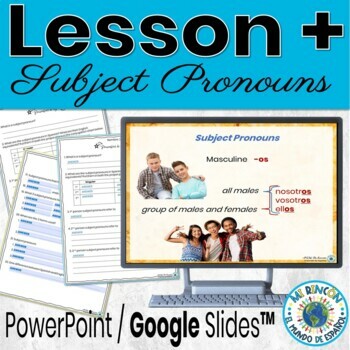 Explore or review subject pronouns with your students. The PowerPoint is animated to aid in the learning process. 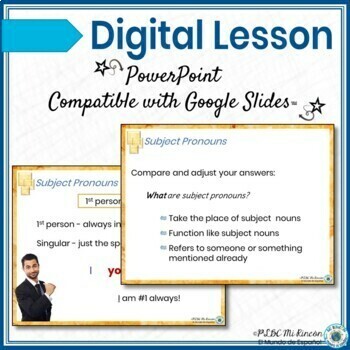 The PowerPoint provides details, connections with English subject pronouns, and examples to help students grasp the use and meaning of Spanish subject pronouns. It uses animation at the end for some self-checking questions. 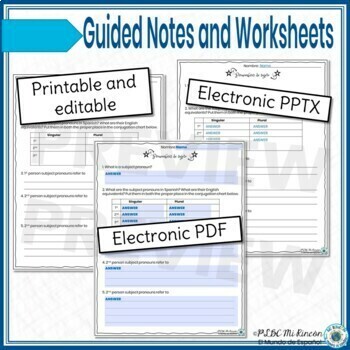 The guided notes and worksheet provide students with written references. The text in all the documents is editable to accommodate different curriculum and classroom needs. The visual and written work together to help students acquire a good understand and beginning level mastery of Spanish subject pronouns. I do include the subject pronoun, vosotros/as, to at least introduce its use, although I do not use it on a regular basis. The lesson can be presented to the class, in groups, or individually as the information is animated to allow a self-paced approach. However, please remember that it is for classroom use only and cannot be copied or sent home with students without purchasing additional licenses.